Strength of Wins/ Pain of Losses thru Week#13. In this first chart below you can see Strength of Wins. Notre Dame remains at the #1 spot this week. Notre Dame has wins over Michigan, Ball St, Vanderbilt, Wake Forest, Stanford, Virginia Tech, Pittsburgh, Navy, Northwestern, Florida St, Syracuse and USC and those teams have a total of 66 wins. 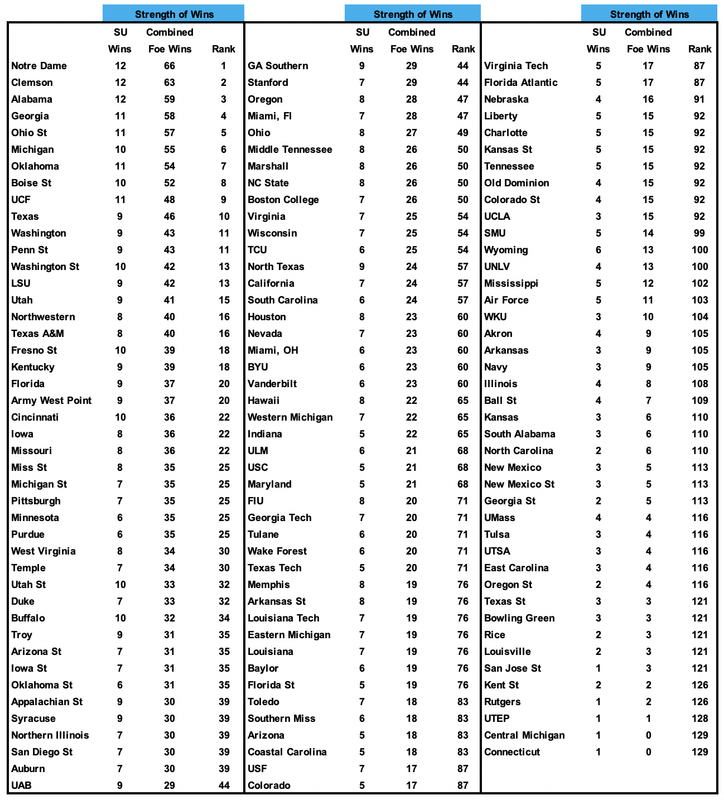 My chart this week grades 2 teams as having credit with a win but their foes have not won a single game vs a FBS foe. This next chart we will go over is the Pain of Losses. Here if you lose to an opponent you get credit for all their losses. At the bottom of the list you can see there are now 4 teams unbeaten. 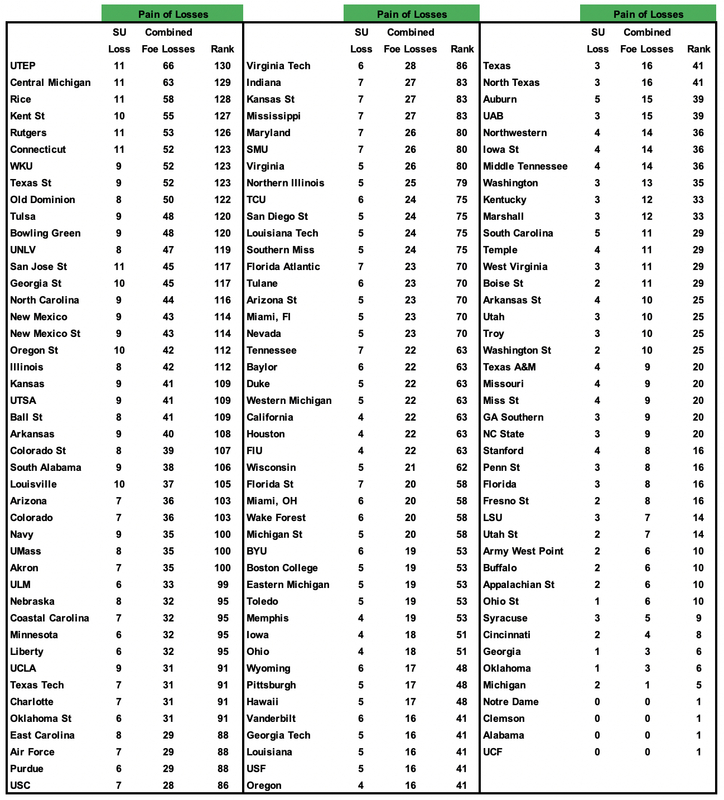 UTEP is on top of this list with a combined 66 foe losses. Their foe losses include Northern Arizona, UNLV, Tennessee, New Mexico St, UTSA, North Texas, Louisiana Tech, UAB, Middle Tennessee, WKU and Louisiana Tech. 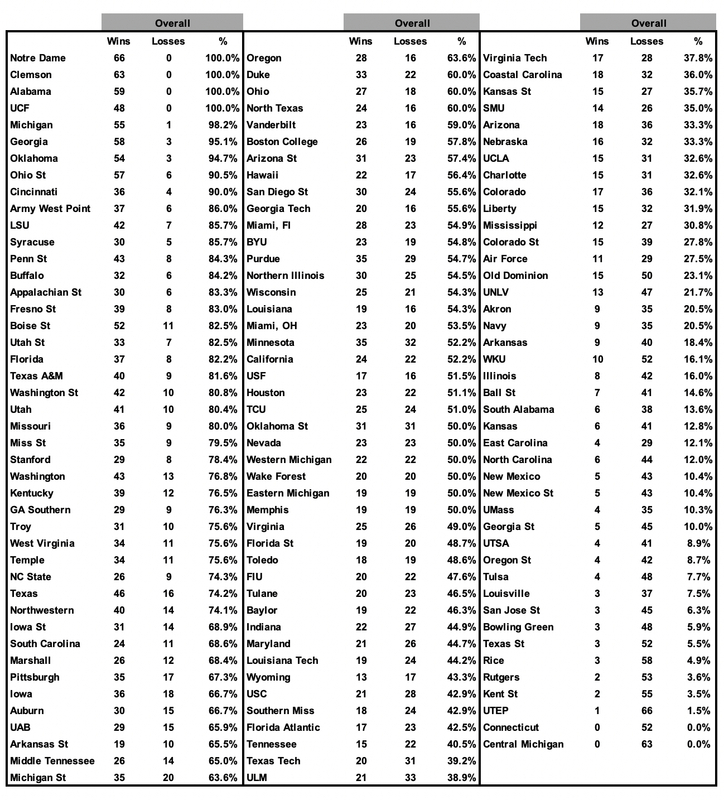 Unlike the Strength of Wins chart, the Pain of Losses chart does include a loss to an FCS foe. I count that loss a 4 towards the combined foe loss record due to the weakness of the opponent. In this last chart below you can see the overall wins and losses. As you can see the top teams are Notre Dame, Clemson and Michigan. At the bottom are the two winless teams.